Solosite Wound Gel, by Smith and Nephew, is a hydrogel wound dressing with preservatives used to apply moisture to rehydrate non-viable tissue around minor burns, superficial lacerations, cuts and abrasions of partial thickness, and skin tears. It absorbs exudate while retaining its structure in the wound, while also creating a moist wound environment, which assists in autolytic debridement, or natural healing of wounds covered in necrotic tissue. 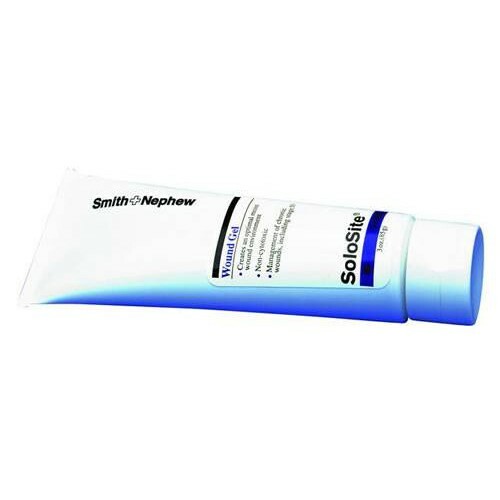 Solosite Wound Gel goes on smooth and provides a gentle, soothing sensation to any wound. A favorite of healthcare professionals everywhere, Solosite Wound Gel also be used to help manage venous ulcers (leg ulcers), surgical incisions, diabetic foot ulcers, and pressure ulcers (including stage IV) by rehydrating and helping to deslough dry eschar from the skin. Vitality Medical also carries other wound care products, such as Curity Drain Sponge Pads and the Allevyn Adhesive Hydrocellular Dressing. Rehydrates and Helps Deslough Dry Eschar. Convenient 3 oz. Flip-Top Tube. Non-Irritating, Non-Sensitizing, Gentle to Fragile Granulation Tissue. Multi-Dose Size Fits Reimbursement Parameters. The SoloSite gel was recommended to me as an excellent healing aid. It works quickly and I'm impressed with the results. My husband got cellulite on his arms due to all the IVs he received while hospitalized. Solosite has been his best source of relief. We'd been trying to get some more & couldn't find it in any pharmacy we visited. Thanks to Vitality Medical my hubby has happy relief again. This gel is great! Solosite gives a great relief--no more sticking bandages! Feels cool and soothing going on. No stinging like I've had with other products. In my opinion don't bother with generics get the original. I've tried them all!